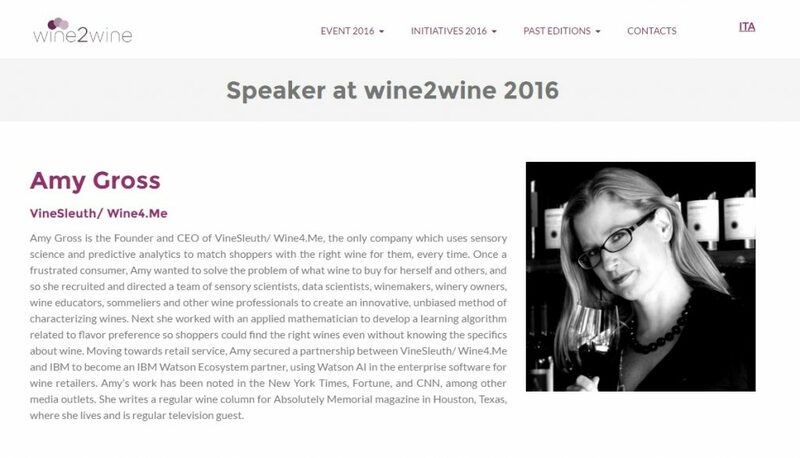 Amy Gross, our founder and CEO, will present at Wine2Wine, a two-day conference in Italy specifically dedicated to the wine business. On December 6 – 7, those in the wine industry, from winery owners to marketing managers, will gather to discuss and share ideas, debate the future of wine, and design the development of the wine growing sector together. Digital Innovation: It is right for wine? From music and media to beauty and fashion, and now even grocery and food, consumers’ lives (and businesses) have been greatly impacted by digital media. During her presentation, Amy Gross, founder of VineSleuth, will outline turning points in other industries that have led to enhanced customer service, loyalty, and increased sales, and discuss whether digital will work for wine, giving us a glimpse of the possibilities. For more information about Wine2Wine, visit their website.